When Lisa Copen, the founder of Rest Ministries for the chronically ill, has joint replacement surgery and then attends church with a scary-looking outrigger splint, she anticipated there would be some kind of response or kindness–since she finally had a “visible” effect of her invisible illness. But she was in for a surprise. It had been many weeks since I have been to church. 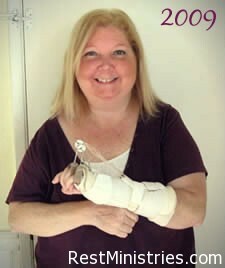 My rheumatoid arthritis had been flaring for months now. I had been off of my main medication since August of 2008 due to infections and then pending surgery. While my husband and son left on Sunday mornings I would attempt to log on to the church’s web site to watch the broadcast. Some days it worked. Some days it did not. A couple of weeks ago, after I had had joint replacement surgery on my left hand, my family decided to go on a Saturday night service when my body would be less sore. Any outing would be nice and I was eager to the back and receive some refreshment from the Lord. We arrived a few minutes early and I went into the bookstore and wandered around. I got a few odd looks from curious people who quickly turned away. I smiled back and people nervously may meet my gaze enough to be polite. While my husband went to check my son into Sunday school, I sat down outside. About six men who were ushers all stood within a few feet with their microphones in their ears, laughing about doing push ups. They glanced over me a few times, obviously wondering if they should talk to me or not. I smiled, as if to invite conversation, but then they turned away back into their safe huddle. Many people walked by and did not even look at me. I’m used to that as I am not some beauty, but still, some people have said my splint resembles something from Edward Scissorhands. 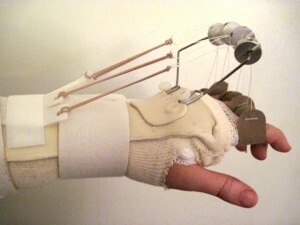 A few people glanced over at the contraption on my hand but never smiled or looked up at my face. My husband and I joined my mother in the church and sat down. During introductions after worship one woman in front of us leaned over and said something like “Boy, that looks like it hurts.” I smiled and said thanks and explained I had gotten new joints. The speaker was Lieutenant General William Boykin (Exceptional! You can listen here.) It was inspiring, and exciting to listen to. At the end of his message “Who Should I Send?” he had everyone close their eyes and people who wanted to accept Christ into their hearts were to raise their hand. We all said the prayer of acceptance of Jesus into our lives together. As the service ended I grabbed my pillow that I had brought to rest my arm on and stood up. My husband was the first of us to leaves the pew and was nudged forward before I could get out of it myself. People streaming out of the church resembled a southern California freeway and I was protecting my hand too much to risk merging into the oncoming traffic. I yelled to husband, “go ahead and go get our son” because I couldn’t “get out.” I waited with my mom about 60 seconds until I could try to merge into the aisle. Guarding my arm, people still brushed by me. Finally I got into the aisle and had to holler back to my mom, “I will meet you outside” as I was pushed along with the crowd. All I wanted to do was glance at the book table to see the price of the book and then to get outside, but people wanted to get to the table ahead of me and also to the long line for the speaker to sign the book. There was confusion over two lines: one to buy the book, the other to get the book signed. So at times I just stopped and tried to wait for the flow of traffic to go by in the opposite direction so that I could get out of the auditorium. At last I got outside. As the evening went on however, I reflected back on my experience. 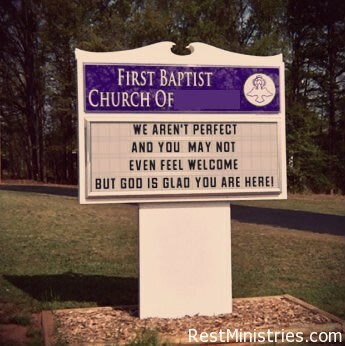 What was the message that the church body sent? There is the human side of me that will admit to that the thought occurred to me if I was a conference with Joni Eareckon Tada’s ministry, Joni and Friends, I would be the speaker, and people would be lining up for me to sign their books, as in the past. But tonight, I was just an inconvenience, someone in the way, someone who would remind people that life was imperfect and they too are vulnerable. I thought about the fact was that the church had just had an amazing speaker who just invited people to accept Jesus into their lives to help them through the valleys and challenges that we will face in this lifetime on earth. What if I was not a believer and my family brought me to church hoping that I would accept Jesus into my heart during this recovery of a joint replacement? What if I was just so encouraged by the speaker that I had actually raised my hand to become a Christian. . . and then I was unable to even get out into the aisle? What does this mean for our church? And those who are ill? I’m not looking for a pity party. I’m not even looking for people to run over and have a conversation about the weird contraption on my hand. For example, it was obvious the men who were ushers felt somewhat uncomfortable, not knowing if they should “intrude” and ask me what had happened to my hand, or if they should ignore it. And at the same time, I hear about many of your experiences too and find that when people believe they can offer a “cure” they are eager to get involved and share their thoughts about your physical condition. Maybe when our condition looks too complicated they shy away since they don’t feel they have answer? What is my reason for sharing this? I asked myself that before writing it, as I don’t want to have it seem as though I am complaining, or looking for sympathy, or expect Christians to be perfect. To be honest, I don’t even know exactly what I want. I debated about sharing this experience with you because I love my church and I know it was a small individualized experience. I think my true reason is that God has given me the gift of being able to have a ministry like Rest Ministries and has placed me in the position of trying to be an advocate for people with chronic illness or invisible illness. I want you to know that I don’t have all the answers, but I am experiencing new things each day, both challenges and blessings. We are in this together–both the journey of chronic illness that God has set us on, and also the steps towards gently educating our church leadership on the emotional and spiritual pain that accompanies the physical pain that many suffer from. We can speak about our experiences. We can share with concern and not bitterness. We can reach out to those we see who are visible pain–and those who may be coping with invisible pain. We can slow down and look around us. We can recognize that those who have suffered are a source of wisdom and encouragement. They may not have a book selling at the back of the church like the speaker did, but they have just as much, if not more, wisdom to give us and joy to share with us. And remember, regardless of the weaknesses of man, God’s love will endure forever. We will never be abandoned. 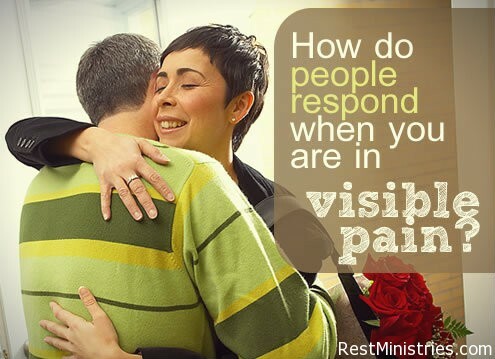 One Response to How Do People Respond When You are in Visible Pain? Thank you so much for sharing this, Lisa! I can relate, as I walk with a cane – so just getting safely in and out of a crowd is a constant challenge!